It’s been a long but wonderful working weekend for me as I served as part of the Nutritional Therapy Association’s instructor team as a group leader for students in the Denver class who had their midterms over the last four days. Needless to say, today feels like it should be a Saturday for me, but there’s not really time for rest on this busy Monday morning. And, because we have had some gorgeous spring-like weather lately, I wanted to share this delicious one-pan shrimp dish that tastes light and full of fresh flavor. 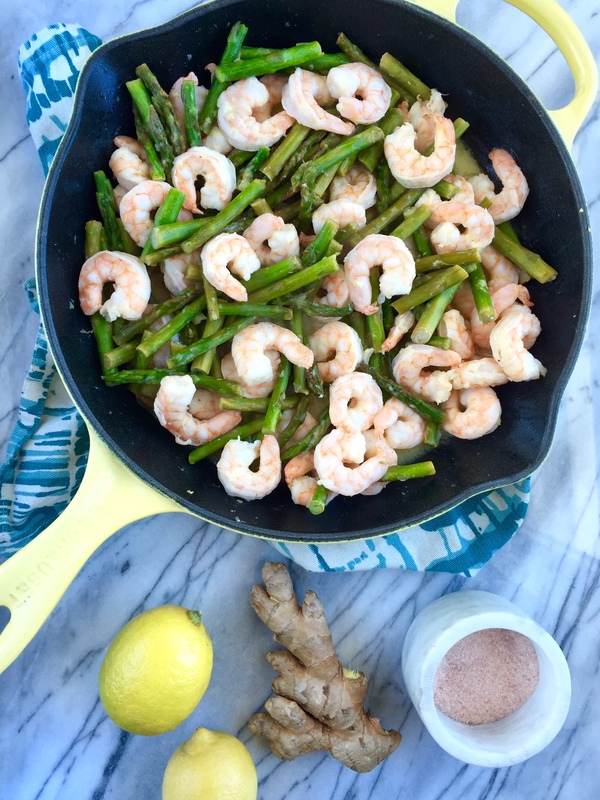 My Lemon Ginger Shrimp comes together in under 15 minutes and is loaded with protein and a variety of vitamins and minerals. The asparagus tastes wonderful in this dish, but you can sub in fresh broccoli if you prefer. It’s great as a stand-alone dish, or serve it with rice or cauliflower rice to make it stretch. Wash and trim asparagus and chop into two-inch sections. Add olive oil or ghee to skillet over medium heat. Add asparagus, fresh garlic, fresh ginger, and the juice of two lemons to the skillet and saute for 5-7 minutes. Add the shrimp to the skillet and saute 3-5 minutes until the shrimp turns light pink and is cooked through. Sprinkle with salt to taste and serve.